Are you looking to add a little bit of sparkle to your invitation game? Do you want your seasonal celebration to have some more festive twinkle? Then it is high time you considered our glitter photo cards for your next gathering. You can add a bit of radiance and shine to any invitation or card you send out, and level up the festivity each time. Glitter cards add a boldness and brightness that most other stationery lacks. If your personality is glowing and animated and you hope that your invitation can represent your personality well, then a glitter photo card is the way to go. Shine bright each time, the way you deserve. Custom photo cards have been a huge hit during the holidays for the past few years. Families use these photo cards in order to stay in touch with relatives and friends whom they won't normally visit or speak to throughout the year. By sending a photo card, you can keep your friends and family in the know, while showing them just how big your children are growing, or how your new family pet fits in. Use your favorite photos to customize your holiday car, and get creative and clever in your correspondence. Family Christmas cards no longer have to be boring or unimpressive. Nowadays, families are getting extremely clever with each holiday email or holiday photo card they send out. Sure, you can stick with the traditional approach and rock those red and green sweaters like no other. Or, you can come up with a creative theme and get fearlessly festive. Adding a bit of family flare into your photo card this year will amp up your holiday game like no other. Make sure that the important life occasions are documented and shared with those you hold dear. Another popular option in our holiday arsenal are our New Year's family photo cards. What better way to usher in a new year than with a photo card featuring your family? Sending out these gems will provide holiday mementos for relatives across the country who get to share in your familial pride. Don't skimp on showcasing your best assets—those who make up your family and fill your heart with love every day. Here at Polka Dot Design, we carry an impressive collection of personalized greeting cards for any and all occasions. Our Exclusive arrangements include over 8,000 designs, all created entirely with our customers in mind. If you want a more tailored photo card, or need something that will surely stand out for your next holiday gathering, then look no further. We will make sure to represent you and your celebration well each time. 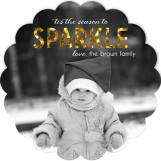 Save BIG on Glitter Family Photo Cards for the holidays with Polka Dot Design coupon codes. For more information, contact us at service@polkadotdesign.com or call the Polka Dot hotline 1-877-816-0884.